According to the Chinese New Year this is the year of the Rooster. It is 10th in the Chinese Zodiac. If you were born in January or February you can use this tool to find out if you are a Rooster. Although not fun to hear, people in their zodiac year are believed to offend Tai Sui, the God of Age. It is believed to bring nothing but bad luck. Therefore Chinese astrology followers pay special attention to their conduct every twelfth year of their lives, i.e. in their birth sign years. Yet, in Chinese tradition, there are some things that people can do to fend off bad luck in a zodiac year and make this your lucky year. Start with wearing Red, it drives away bad luck. Red is one of the luckiest colors in Chinese culture, standing for prosperity, loyalty, success, and happiness. It is especially important to wear if you are a Rooster. If you are not into the color head to toe, try an accessory, like, a red bag, shoes, socks or lingerie. Here is the catch if it is new it has to be purchased by someone else, like a family member or friend. Next option is to wear jade accessories to ward off bad luck. A pair of pretty jade earrings, a bracelet or two made of jade stones or a stand out necklace to bring in a little more luck. Try just carrying a Jade crystal for extra protection through out the day too. Finally, Coins are used in Feng Shui to bring prosperity and ward off misfortune. Fortunately, Links of London has your lucky charm. 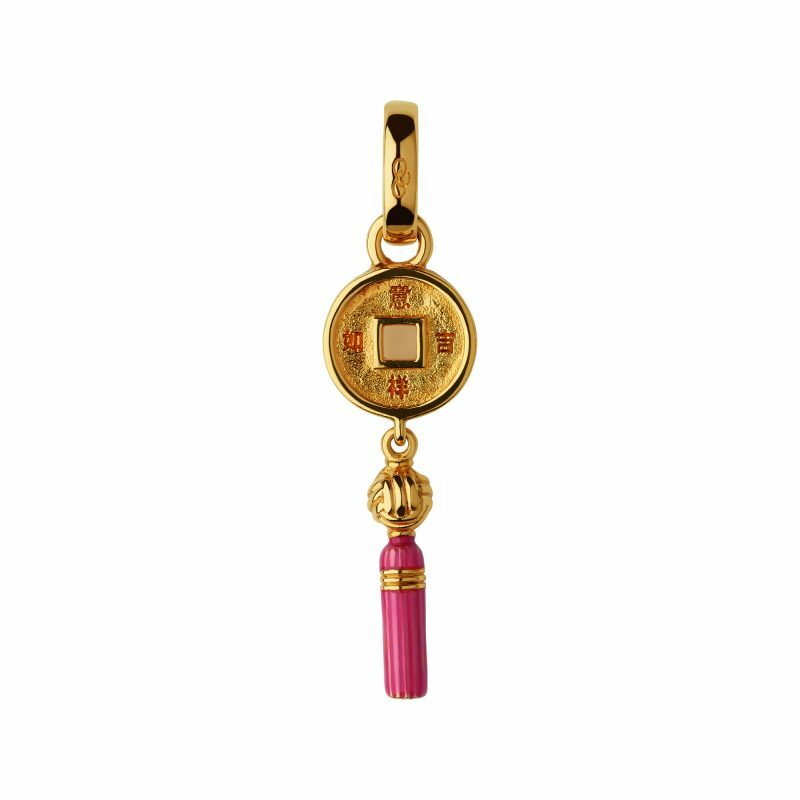 Adorned with a red tassel, and engraved with Chinese inscription symbols meaning “Luck and prosperity in everything” is their coin charm. No matter what always remember your mind and heart are your luckiest charms. Think positive, feel happy and embrace love. These are your most powerful tools.